Well, this week I am on top of it. But only because after I posted last week’s (late) menu plan, I went ahead and wrote up this week’s menu plan since I already had it prepared. I am not sure what the theme is over at this week’s Gluten Free Menu Swap, but be sure to go over and check it out for some added inspiration. This week is focused on quick meals and make-ahead meals. With school and work now, I am trying to make dinner pretty uncomplicated. I’ve already made the soup and a batch of quinoa to get a jump start on things. Red Beans and Rice – an old standby. Simple, with some rice and a green salad. A great one to stick in the frig for later in the week as ‘leftovers’. Quinoa with Brussels Sprouts, Chickpeas, Cranberries, Blue Cheese and Pecans – it will be something along the lines of what I linked to, but I plan on modifying it a bit. Wild Rice and Mushroom Soup – a new-to-us recipe. This is a recipe that I had pinned on Pinterest (dangerously addicting!) and I gave hubby the choice of three soups that I had pinned and he chose this one. I subbed the chicken with two cans of drained and rinsed white beans. Thai Quinoa – my brother and his girlfriend really liked this and she and I both had pinned it. So I decided it was time to try it out too. Yes, I know we have two quinoa recipes this week but that is just how it turned out. Quinoa is so versatile and easy to throw together as a quick meal. What are your favorite quick meals? Meal Plan Friday…not Monday. This week has been crazy. I started my new part-time job working at the hospital as a diet aide. It’s kind of the starting point for clinical dietitians-in-training/schooling. I am sitting here with a nice glass of wine in me after being on my feet for 8+ hours today – the first time in years that I have done that (all day on my feet, that is, not the wine)! Mediterranean Salad with Socca – it’s been quite a while since we have had this salad and my husband claimed he loved it (I like it a lot too, I was just surprised that he did too). So, I guess I need to add this one back into our normal repertoire! And the socca I am still trying to perfect…I’ve tried multiple recipes and I am not happy with any one in particular yet, but I love the concept and will keep trying! Rosemary Chickpea and Spinach Soup – recipe from Madhur Jaffrey’s World Vegetarian cookbook. This soup was okay, nothing to write home about so I probably won’t be making it again. Last Minute Sesame Noodles – always tasty! Chickpea Picatta over Mashed Potatoes and Arugula – yum, another one we haven’t had in a while. It is super! Even hubby liked the arugula. And I am sitting here drinking the rest of the wine I used in it. What is hitting the spot at your house this week? Cauliflower Crust Pizza with Raw Kale and Avocado Salad with Lime-Sriracha Vinaigrette – we love our kale salads, and we love sriracha, so this is a big winner at our house! And of course, as I mentioned in the last post, we have fallen for the pizza crust too. Sweet Potato, Black Bean and Kale Tacos with Slaw – we didn’t get to this last week, so we’ll be having it this week. And I think I finally have the recipe the way I like it so hopefully I will get around to posting it this week. Vindaloo Vegetables with Rice – from my favorite slow cooker cookbook, Fresh from the Vegetarian Slow Cooker. A recipe to put in the frig for the week. Potatoes and Peas in Red Curry – from another vegetarian slow cooker cookbook I found at Powell’s in Portland this summer called The Gourmet Vegetarian Slow Cooker. Another meal to be made and placed in the frig for later in the week. Curried Red Lentil Soup – a Deborah Madison recipe, from Vegetarian Cooking for Everyone. Roasted Tofu with Brussels Sprouts and Brown Rice – I like to take advantage of having the oven on and roast both the tofu and sprouts. Roasting tofu makes for a nice chewy texture. I will probably make some sort of peanut sauce for the tofu and rice, or just use some pre-made San-J brand peanut sauce. This week’s theme for the Gluten Free Menu Swap is beef. We don’t eat a whole lot of that around here (I do, sometimes), but if you do, be sure to check out the other menus posted over at Celiac Family. And even if not, there is plenty of inspiration for everyone! What are you having this week? With my school and volunteer activity schedule these days, I have had to revise my typical meal planning/grocery shopping routine. I am not home from class until later in the evening on two nights and one evening I volunteer and so I am not home until quite late. But my husband is usually home on these evenings, and I like to make sure he is eating well even if I can’t be home (otherwise he’d be – happily – eating frozen pizza every night!). So, I have been utilizing some of my favorite kitchen tools, my slow cooker and pressure cooker, to make things a bit easier. On Sundays or Mondays, I have been cooking up two meals, at least one meal in the slow cooker, sometimes I even get both cookers out and fire them both up. These meals I just then put in the frig for later in the week. The same goes for the pressure cooker (PC). This morning I have one slow cooker going and I have cooked some dry black beans in the PC for one meal this week (tacos below) and in a bit I am going to cook up another meal in the PC for later this week. 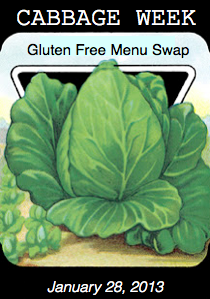 This week’s theme for the Gluten Free Menu Swap is cabbage and it is being hosted by Angela’s Kitchen. If you need help meal planning be sure to hop over there and check out what everyone else has on their menu plan this week for some inspiration. I wasn’t even paying attention to the theme for the week, but I have been on a cabbage kick lately myself (love me some spicy slaw!) and this week I have two meals with cabbage as a key ingredient. Perfect Hominy White Bean Chili from Fresh from the Vegetarian Slow Cooker and possibly this Raw Kale with Lime-Sriracha Vinaigrette Salad – the chili is in the slow cooker as I type and will be put in the frig for later in the week. Dilled Cabbage Soup with Rice and possibly veggie burgers on the side – this is my pressure cooker recipe this week. The recipe comes from Lorna Sass’s Great Vegetarian Cooking Under Pressure. Also going into the frig for later in the week. Cauliflower Crust Pizza and Salad – we are loving cauliflower crust pizza!!! Buffalo “Wing” Chickpea Salad – my version is coming soon, inspired by this recipe. Black Bean, Sweet Potato and Kale Tacos with Spicy Slaw – a recipe in the works for the tacos. Homemade Black Bean Tamales – from the freezer, if needed. What’s on your meal plan for the week? This week’s theme for the Gluten Free Menu Swap is garlic and the hostess is Wendy at Celiacs in the House. Unfortunately I did not plant any garlic last fall, so I won’t be harvesting any this summer. Last year’s crop didn’t do so well and then time got away from me and I never planted any last fall. So I have resorted to buying it at the farmer’s market from my favorite garlic and potato guy. He grows a lot of different varieties of both and we always enjoy chatting. Green -Chile Cheese Tamales with refried beans and kale salad – from the most recent batch of frozen tamales. Spicy Buffalo Chickpea Salad – an interesting salad I found on Pinterest. 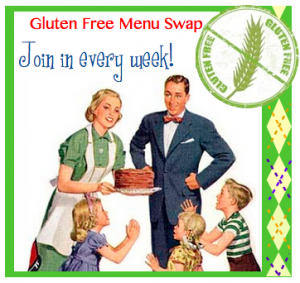 This week’s Gluten Free Menu Swap is being hosted by Heather at Celiac Family and this week’s theme is Avocado!! We love avocado! Almost always, there are a couple sitting around the kitchen, whether on the counter or in the frig. My husband grew up with avocados while living in Arizona and California as a kid, but I did not, not in Ohio. My mother-in-law even used them as baby food for my husband. I probably didn’t even touch guacamole until I was out of college, let alone avocado. Once I learned to like guacamole (thanks, Chipotle!) and then actually make guacamole, I still kind of kept my distance from them, because of all the fat. But these days, I am embracing the healthy fat in them and enjoying them frequently. Sometimes they can be expensive, but I have found that the price and quality of avocados at our local Trader Joe’s is pretty consistently good. But we are also relatively ‘close’ to the avocado farms of SoCal and Mexico, so that may factor in too. I am so glad I finally embraced them! Lately I have been enjoying them mashed and spread on a piece of toast with a bit of salt, or mashed up with a bit of balsamic salad dressing in a wrap, or as a smashed chickpea-avocado sandwich. And of course made into guacamole with a bit of cumin. Yum. This week we will enjoy avocado with our Savory Pinto Beans. Chickpea Picatta with Mashed Potatoes and Kale – instead of arugula, I will put it over kale, which is growing like mad in our garden. Creamy Light Macaroni and Cheese – I saw this recipe a few months ago in Cooking Light magazine, one of my favorite sources of inspiration, but haven’t made it yet. I recently found some Kosher for Passover ‘panko’ flakes and they are begging to be used in this unique macaroni and cheese recipe. I will probably serve it up with either a massaged kale salad or some roasted broccoli. Curried Lentils with Paneer and Indian Spiced Roasted Cauliflower – we are totally digging roasted cauliflower and broccoli right now. Be sure to “hop” over to Celiac Family later this week and check out the other menu plans as they are posted. All day today, I kept sitting down to work out this week’s meal plan, but I wasn’t getting anywhere. A mental block. And only because I had a question for my husband. But he was unreachable since he was off snowboarding. Finally he returned home and we were able to talk. “What are we doing for Christmas this year?” I know, I know. Most of you have traditions and everything has been planned out for months. Not us. Four years ago we moved across the country, away from our families, and so we are on our own for this holiday. But that’s okay. We’re not big on Christmas. We have made some of our own new traditions, based upon our new home and the local traditions. For one, on Christmas Eve we will head down to Old Town Albuquerque to walk around and drink hot cocoa and look at the luminarias on the plaza, or we’ll head up to Canyon Road in Santa Fe to browse the art galleries and look at the lights, also while drinking hot cocoa. On Christmas Day, we typically go visit our friends at the Pueblo of Santa Ana and watch the dances for a while in the morning, weather dependent, of course. Then, with some juniper and pinyon burning in the fireplace, we will make a special meal for ourselves. It varies from year to year. Sometimes we’ve each made our favorite foods or something that we don’t eat very often. For me, in the past, it has been shrimp cocktail or bacon-wrapped scallops or some such thing. Another year we made spring rolls. We’ve done the traditional New Mexican thing too, and eaten tamales. We talked about making sushi this year. But I think this evening we settled on making spring rolls again, maybe with some sushi flavors? Spring roll-sushi fusion rolls…? So now that that is settled, I could finish up my meal plan for the week. The theme over at Celiac Family this week for the Gluten Free Menu Swap is Holiday Favorites, and appropriately so. So be sure to head over later in the week and check out who else linked up. Maybe you will find your new holiday family favorite. Indian-Spiced Roasted Squash Soup with Pierogies – I only just made the soup today for later in the week. Probably with some Pierogies – Conte’s for me and gluten-filled for hubby. (Can you believe that I have never had a pierogie? I am excited to try them.) And maybe with some Roasted Cauliflower and Broccoli that needs to be eaten. Spring Rolls – for Christmas Day. We’ll fill them with marinated tofu, lettuce, cucumbers, bell pepper, basil, cilantro, mint, rice vermicelli noodles, avocado, shitake mushrooms and maybe some sushi flavors – nori, pickled ginger, wasabi paste, cucumber, avocado, and maybe some smoked salmon and cream cheese for me! It fun to play with them!